'Kai has mutiple joint arthritis and hip dysplasia. 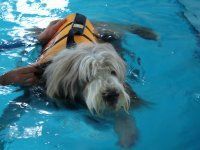 Before he started his hydrotherapy he was in obvious discomfort most of the time, very stiff after resting and fed up with life in general. I really felt I was losing him to his health problems. 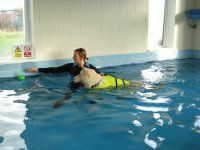 Kai had his first session with Lorna back in November 2011. 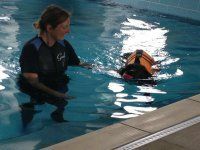 I had tears in my eyes as I watched Kai try to swim, I did not realise how much Kai's body had deteriorated. After a month the changes to Kai were already happening, less stiff, stronger, happier and more energy. I couldn't believe how quickly he was responding. Kai was on his way back! Today Kai is an active participant in life. Although I can't make his hip dysplasia go away the symptoms of his condition have greatly reduced. I swim with him now and it is really something to watch him power out with his hind legs as we race for the toy.